Another one of our "must do's" at The Animal Kingdom, is head to the Tree of Life to watch It's a Bug's Life. I think their favorite part is just being silly with the 3D glasses. I used a black paint dabber to spot up the background. Cute LO!! Thanks for pplaying @ 2 Broke Girls. Fantastic page! 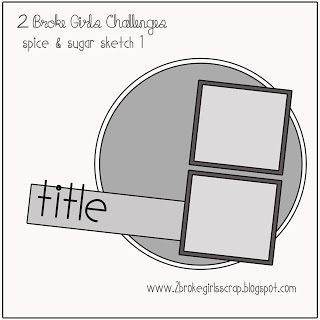 Thanks for joining our sketch-a-thon at 2 Broke Girls! Great job with the sketch, thanks for playing along!